"We've recovered 20 bodies. Most them had been brutally hacked to death with sharp weapons," army spokesman Brigadier General Nayeem Ashfaq Chowdhury told reporters, without giving the nationality of the victims. - Prime Minister Sheikh Hasina said she was determined to eradicate terrorism in Bangladesh Saturday after security forces stormed a cafe where extremists had taken dozens of diners hostage. "It was an extremely heinous act. What kind of Muslims are these people? They don't have any religion," she said in a televised speech. "People must resist these terrorists. My government is determined to root out terrorism and militancy from Bangladesh." - Bangladesh security forces ended a siege Saturday after storming a cafe in Dhaka where dozens of diners had been held captive through the night and shot dead six of the hostage-takers. 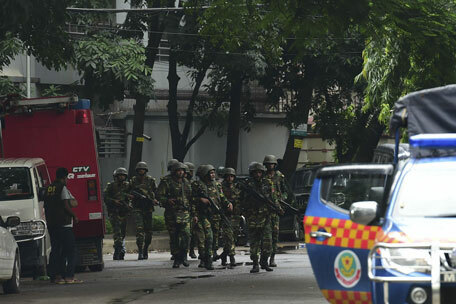 Heavily armed Bangladeshi commandos stormed a Dhaka restaurant Saturday where suspected militants were holding dozens of people hostage, including foreigners, after a deadly firefight with police, officials said. "The operation has began. Commandos have stormed the restaurant," a security official said. An AFP photographer at the scene said he could hear a massive gunfight as security forces launched the rescue operation more than 10 hours after militants seized the hostages. Five Bangladeshi hostages were rescued in the first few minutes of the operation, the security official told AFP. "They are rescued unharmed," he said. The Deash (IS) group claimed responsibility for the attack Friday night on the Holey Artisan Bakery restaurant in the capital's upmarket Gulshan diplomatic quarter in which two police officers were killed. Police said the gunmen burst into the restaurant shouting as people were having dinner at around 9:20 pm (1520 GMT) and set off explosives. Italy's ambassador Mario Palma told Italian state television seven Italians were among the hostages. Japan said some of its nationals may also have been among the captives. "There is no desire to negotiate," Palma said of the attackers. "It's a suicide mission." Some diners managed to escape including an Argentine chef and a Bangladeshi man who took refuge in an adjacent building, but police said there were still a number of people being held inside the restaurant hours after the assault. Some managed to speak to relatives by phone, reporting there were up to 40 people trapped inside, around half of them foreigners, the private Ekattur TV station said. "He is very nervous," the man's uncle, who had spoken to him by phone, told AFP. The White House said US President Barack Obama had been briefed on the attack, a rare occurrence in an area of Dhaka considered relatively safe. The restaurant's supervisor Sumon Reza who escaped by jumping from the roof told a local newspaper there were 20 foreigners being held hostage. "I was in the roof. The whole building was shaking when they set off explosives," he said. Bangladesh has been reeling from a wave of murders of religious minorities and secular activists by suspected militants. But those murders generally only involved a handful of assailants and the latest attack appears to have been on a much bigger scale and the first time that people were held hostage. The IS-linked Amaq news agency said the group was behind the attack and that "more than 20 people of different nationalities (were) killed". Heavily armed police and paramilitary guards had cordoned off the area around the restaurant after the gunfight broke out when the militants launched their attack. "Two police officers including the head of Banani police station were killed. It appeared they were hit by bullets and splinters from a grenade," deputy commissioner of Dhaka police Sheikh Nazmul Alam told AFP. "Up to 20 police officers were injured. Seven-eight people have come out of the restaurant. But there are some people inside." The attack took place near the Nordic Club, where expatriates gather, and the Qatari, Italian and Egyptian embassies, as Bangladesh observes the Muslim holy month of Ramadan. French ambassador Sophie Aubert said the restaurant was "very popular" with diplomats and other foreigners in Dhaka. The attack follows a series of killings targeting foreigners in Bangladesh that have been claimed by the Daesh group. They have blamed the main opposition Bangladesh Nationalist Party (BNP) and its ally.